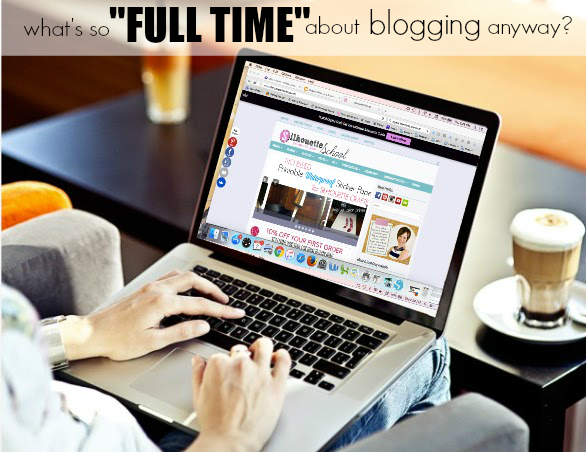 Full Time Blogger Schedule: I Mean Does It Really Take THAT Much Time? So what's it really like being a full time blogger? I mean what's so hard about putting a post up every day? Is that really full time work?! You have to understand I didn't wake up one day and BAM I started blogging all.day.long. Nope, like anything it kind of evolved and over the last eight years it's turned from a hobby blog into this...the point where we're both going to be blogging full time. I've run the blogging/freelance gamut from keeping a mom blog where I shared my babies' nursing schedules to writing a pretty high profile entertainment column on MTV Jersey Shore to writing a DIY blog which then had it's own spinoff ... now my flagship blog Silhouette School. Each of the blogs required something different...nothing has required anything like the attention that Silhouette School has. But then again nothing has been as rewarding either! Silhouette School is my third baby. I've nurtured and loved that thing and hated it and pulled my hair out over it and cursed it and loved it more and more. It's been demanding and finicky it's challenged me and kept me up and night...it's been one of my proudest accomplishments career-wise. It's opened up doors and opportunities that I never would have had if I didn't give it the attention I have. So what type of attention does a blog need? Obviously you need to write blog posts. That's where all bloggers start. We're just pecking out posts...each blog and each blog post is going to require something different. For Boss Lady and Bob I can simply sit down and start typing out my thoughts. But for Silhouette School I write tutorials...I have to not only take screen shots of the software, edit the photos, and take pictures of the projects, but also write up the actual post. It's a lot more labor intensive. Of course the writing takes up time...but there's no use in writing blog posts if you're not going to promote and market them (I'm talking in terms of full time pro bloggers here). That's where the marketing and social media aspect of blogging come in. In order to grow your blog you need to grow social media outlets which means you need to engage with readers, post and schedule interesting, quality content, answer comments, pin, tweet, Instagram, create videos, share, follow back...the list goes on...and on...and on. For me social media and email became such a job that I needed to hire an assistant. Ashlee started off working an hour a day, five days a week but is now up to three hours a week. For the last two months I've also had a second assistant who has worked an additional hour a day five days a week. That's 22 hours a week and it's about as close to a clone as I can get. In addition, to the blog posts and social media, in February 2015 I launched my first book and by the end of the year had five more out for a total of 6 books (2 full length books and 4 mini guides) in 11 months. Did I mention Blake was only in school 3 hours a day 5 days a week at this point. Thankfully he napped for me until he turned 5 so I managed to get about 5 hours of solid, uninterrupted work done a day. With the launch of the books, the blog went to a whole new level. We were dealing with massive amounts of transactions, customers needing new download links for their ebooks, a network of affiliates who were also promoting the book, converting the original book into paperback, partnering with a huge retailer to get the books bundled with the Silhouette machines and sold on Amazon, time consuming legal issues which nearly lead to litigation, and the invitation to begin speaking at conferences which required a whole lot of prep work in the way of two 90 minute presentations completely from scratch. As both the blog grew and the books gained popularity - selling more than 13,000 copies to date - more and more businesses and retailers grew interested in opportunities to get in front of my growing social media following and blog readers. Adding sponsors and clients to the mix means keeping extremely organizing with invoicing, posting sponsored content, and meeting even stricter deadlines. You can see that as the blog grows the amount of time and energy spent on actual blogging - pecking out posts - becomes a smaller and smaller piece of the time pie. It's equally as important - I still post every.single.weekday - but the amount of work to maintain and continue to grow just become greater. And since I'm not getting any more hours in the day it just means I work more...and I outsource more. Obviously it's now to the point where Bob will be coming on board to take over the business side of things. He'll be dealing with all the things that give me a headache and I'll be free to do my creative thing and continue to generate new streams of income!